Exploring free improvisation, prepared guitar and electronic soundscapes. Ernesto Diaz-Infante’s musical compositions span a broad perspective: transcendental piano, noise, avant-garde guitar, field recordings, lo-fi four-track manipulations, and experimental song. He received his MFA from CalArts in Music Composition. He composed music for the documentary “The Cult of JT Leroy,” and his most recent work is his solo guitar composition “For M.F.” album on Pax Recordings. He lives in San Francisco with filmmaker Marjorie Sturm and their son and daughter. Ezra Sturm is a student at George Washington High school in San Francisco. He studied music at Community Music Center and with J Lee. This is his first public performance on the Korg Minilogue synthesizer. His inspirations have been MGMT and Boards of Canada. He enjoys making dreamy soundscapes using synthesis and other techniques. Ishmael ALi is a guitarist, composer, and improviser based out of Chicago who plays music that focuses on exploring sound through free jazz, collaborative improvisation, and experimental music. Current projects include Colossal Kitten, a trio with Aaron Quinn (Brooklyn) and Stephen Boegehold (Brooklyn), Errata, an electro-acoustic guitar/drums duo that experiments with live synthesis; and Bison Bison, a quartet that draws from the music of Paul Motian. Saxophonist John Ingle is originally from Memphis, TN and now resides and works in San Francisco. 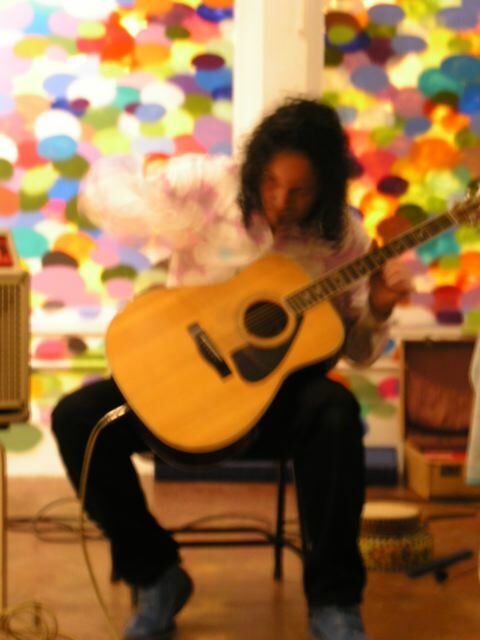 His music is informed and influenced by contemparary concert music, jazz, electronic music, improvised music, various Asian folk traditions, and the blues and gospel of his native Southeast US. John's solo saxophone music emphasizes multiphonics and subtle control of extended saxophone techniques. He has developed a style of harmonic singing that he uses through the saxophone. He has a Master of Arts degree from Mills College where he studied with Pauline Oliveros and Glen Spearman, among others.